Template-Stripped Gold Chips provide an ultra-flat pristine gold surface for research applications including AFM and SEM, biosensor development, and studies of self-assembled monolayers. The chips are fabricated by coating the flattest available prime grade silicon wafers or freshly-split mica, with no adhesion layer. Then, 1cmx1cm square glass chips are epoxy-glued to the surface. The gold surface you use is the one in contact with the silicon or mica substrate, so it is ultra-flat and protected from the atmosphere until you are ready to use it. RMS roughness approaching atomic flatness. Uncontaminated Surface – Gold is protected from the atmosphere until stripped from the template, providing a pristine surface free from organics and other atmospheric contaminants. Ready to Use – Chips do not require cleaning, eliminating the need for hazardous cleaning solutions or expensive cleaning equipment. 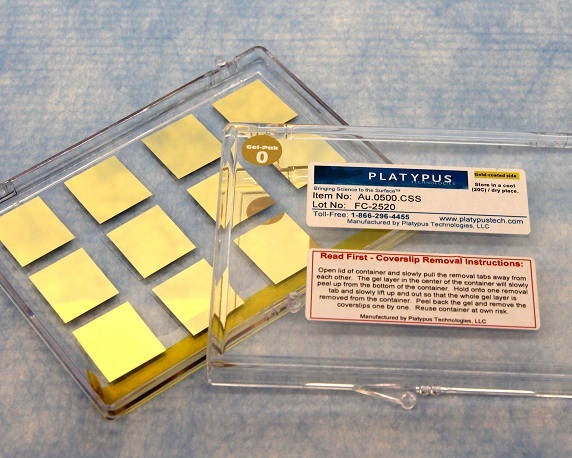 Convenient – Multiple chips per template make it easy to prepare fresh, clean, and ultraflat chips just seconds before your next experiment. 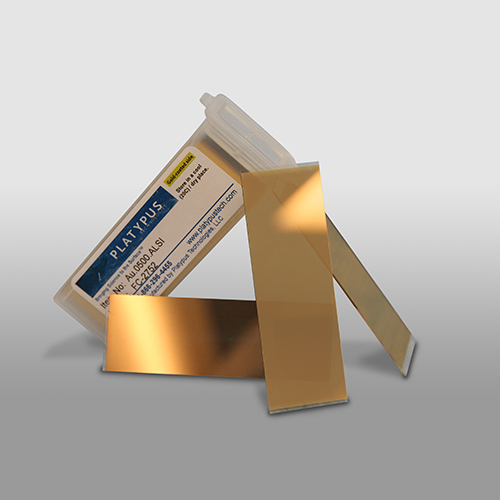 Platypus Technologies’ Ultra-flat gold films have a uniform Au(111) orientation that covers the entire surface area of the chip. Ultra-flat gold surfaces enable high-resolution characterization of single molecules and self-assembled monolayers (SAM) via atomic force microscopy (AFM) or scanning tunneling microscopy (STM). Ultra-flat gold surfaces are ideal for applications in self-assembly, single-molecule imaging, nano-contact printing, DNA origami, or nano-photonics.